Sacred Objects, Places, and People (Part 2 of 3) . 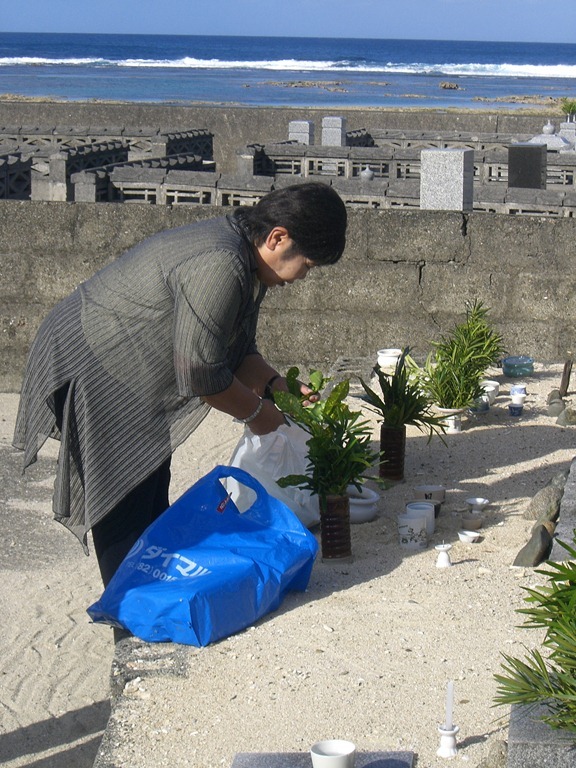 . .
Residing on Tokuno-shima (Japan), every 1st and 15th day of the lunar calendar, she makes the journey from her home to the place where her ancestors are buried offering prayers to black ancestral stones. To her, once buried in the sand, the ancestors now reside within the black stones with each black stone representing a whole generation of ancestors. 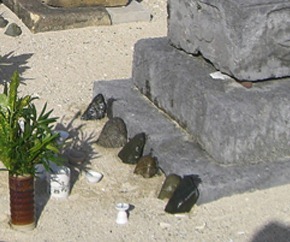 When conversing with the people of Tokuno-shima, one would hear more than once in the local dialect (hogen) the common greeting, “Shitte mute yone ogameera!” Translated “let’s worship,” it reinforces the priority to show respect to one’s ancestors by visiting the geographical location of the ancestral black stones. In fact, showing respect to one’s ancestors is so much a part of the identity of the people, the town hall signboard lists “first respect ancestors” as the first requirement of being a good citizen. Found throughout the world, sacred places – geographical locations – are seen as places that can heal, rejuvenate, protect, etc. Near mountains, oceans, lakes, rocks, waterfalls, valleys, and so on, no geographical location escapes becoming a sacred place. Sometimes they are seen as the origin of creation, the resting place of specific deities, or auspicious places for maintaining balance between secular and sacred space. 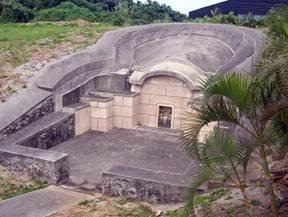 Its unique, sculpted “turtleback tombs” (seen below) are sacred places for Okinawans. They are places for ancestor worship, meant to honor their ancestors in the afterlife. These tombs are “a part of the great Chinese cultural influence that once dominated the islands.” Whole family groups may be interred in them, as they are quite large and owned jointly. The turtleback shape of the tombs with protruding walls as “legs” represents a woman in childbirth, and burial in them suggests returning to the source where one came, from the mother’s womb. Blood relatives observe a special day called Shiimii at their ancestors’ tombs each April to honor them through ceremony, food and drink in front of their tombs. The family tomb is normally located in remote parts of towns and villages and prayers are offered only on special occasions as opposed to family altars. During the Seimei Festival, family members visit the tomb with delicacies and pray to their ancestral spirits. 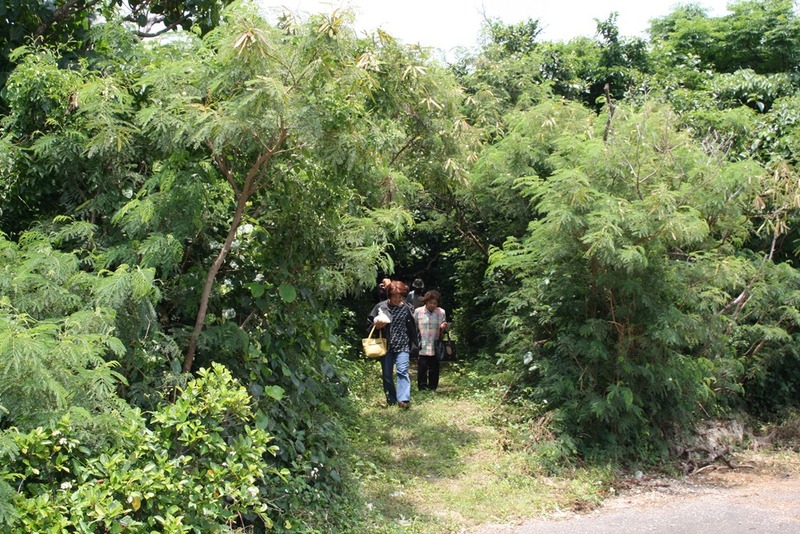 For Okinawans, other sacred places include utaki groves (seen to the right), kitchen hearths, family altars, tombs, and a utopia called Nirai Kanai. Nirai Kanai is across the horizon and is the “original nation,” the source of all things bestowed upon Okinawa’s inhabitants. It is a place of ancestor spirits, a place of fertility and beginning, where children come from, and a place of the end, where the dead return. Gods live in Nirai Kanai and is the origin of all riches; wealth, fertility and life. When gods visit once a year to bless and then return, rituals remain to mark their appearance. Fire came from there as did grains. Nirai Kanai is a source of power and renewal related to the harvest. 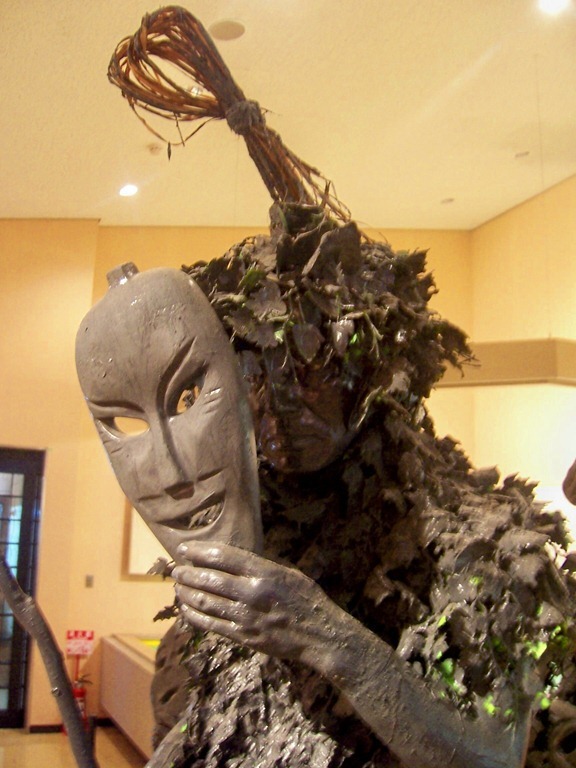 While on Okinawa’s main island, the gods from Nirai Kanai are ideological and invisible, in the Yaeyama Islands (south of Okinawa) the gods take on visible, tangible forms, incarnated by community members wearing masks and costumes. 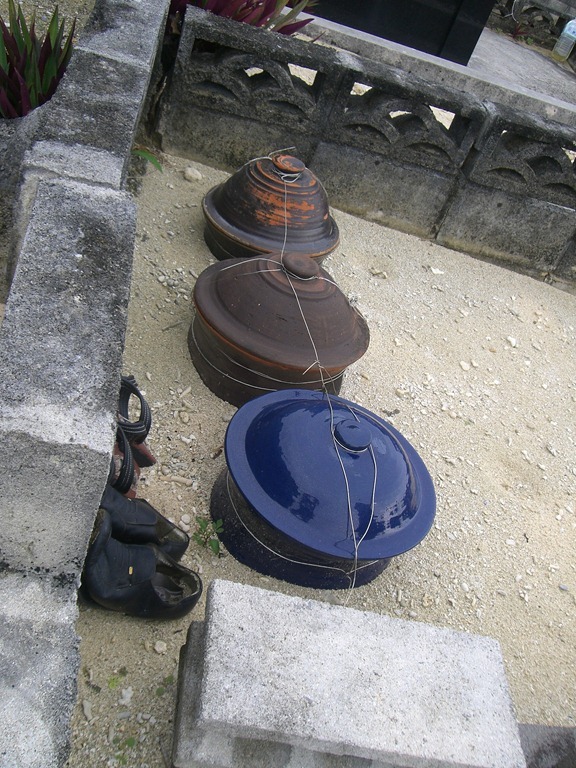 On Yoron island (just north of Okinawa island) the people use urns to bury the dead, and then place the urn in the ground or sometimes in a miniature house with a roof. During the festival of the souls (Obon), they unlock the door to celebrate the ancestors coming home. After the festival, they go back to the grave and lock the door. Sacred places evoke worship and veneration from people and are intended to bring protection, good fortune and bountiful harvests. Festivals, rites and events are held related to seasons, harvests, farming and fishing, and ancestor worship. 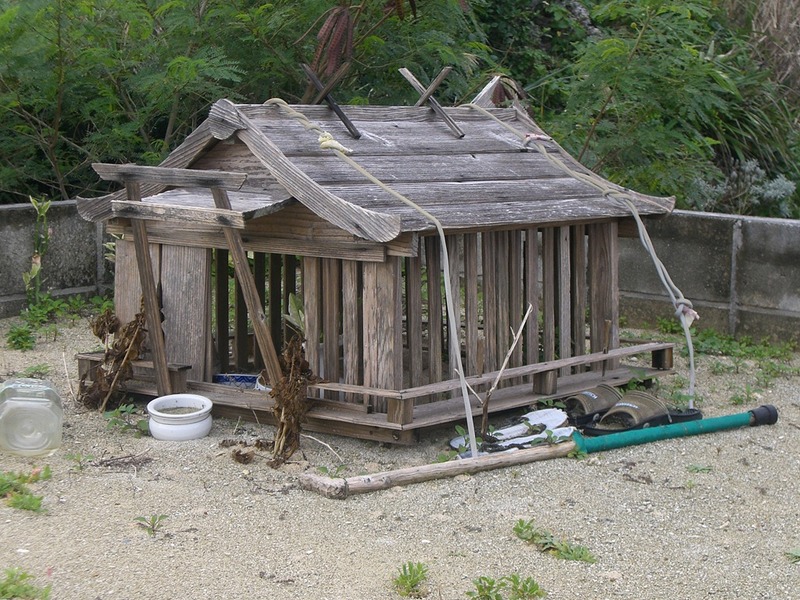 For the vast majority of the Ryukyu-Okinawan peoples, rites and rituals have remained unchanged throughout history. Even modernization has not changed the belief that spirits lie within the mountains, the sea, the trees and animals. Similar to sacred objects, sacred places in a real sense serve as mediators between the secular and the other world, a sacred one. Previous PostSacred Objects, Places, and People (Part 1 of 3) . . .Next PostSacred Objects, Places, and People (Part 3 of 3) . . .